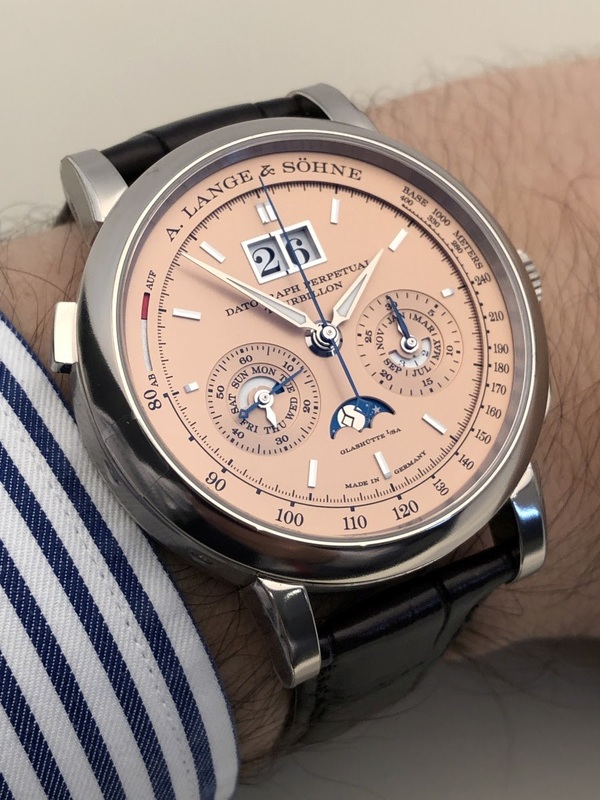 I will very quickly kill the suspense: the Lange & Söhne SIHH 2019 collection was not the most spectacular of the decade. I want to say: all the better. I find that a brand of the size of the Saxon Manufacture doesn't need to release loads of novelties to draw the attention. Do not forget, its annual production is around 5,000 pieces. In addition, as one of the current problems of the brand is to release the latest watches and the complicated ones within a reasonable time, it is better that it releases a limited number novelties and that it makes them available in boutiques with less wait. Customers and retailers will prefer this situation. 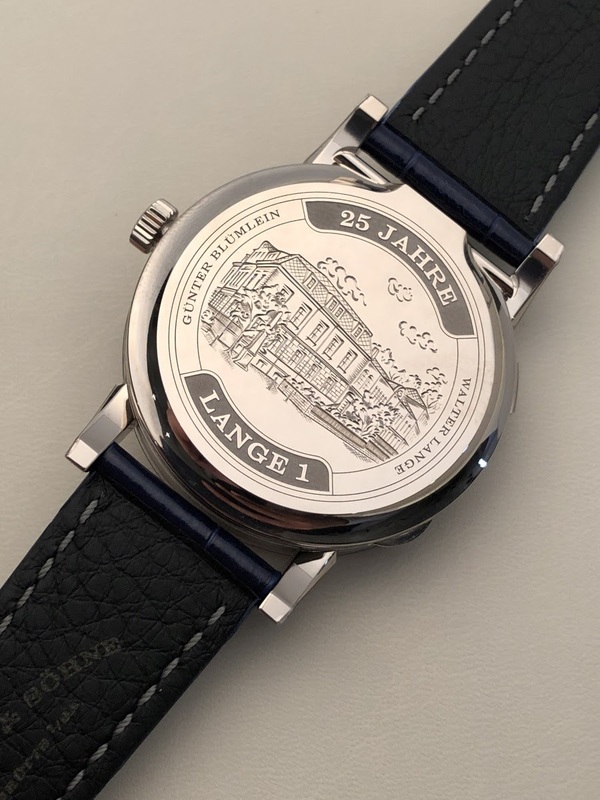 2019 is however a special year: it is the 25th anniversary of the presentation of the rebirth collection and therefore of the the Lange One. It is also the 20th anniversary of the Datograph but it seems that the celebration has already taken place with the release of the Datograph Lumen at the end of last year. In fact, the SIHH collection includes a commemorative Lange One, but it is the first step in a celebration that will continue throughout the year with the release each month until October of a special Lange One in a limited edition. Thus, 9 other watches will be presented along the way and so the next one will come very quickly. This agenda also explains why the SIHH collection is made of 5 pieces only. And more surprisingly perhaps: Lange offers only one true new caliber. The good news is that this collection is dense and smartly designed. The other side of the coin is its price tags. 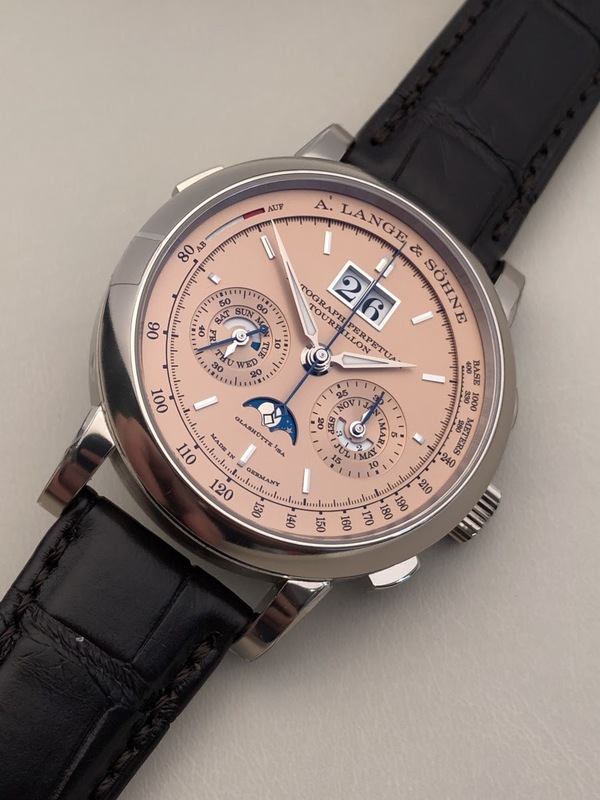 The least expensive watch is the Lange One 25th anniversary, priced at 43,700 euros. So there is nothing in the 20-40K segment which is still a problem when you want to renew the customer base or strengthen iyour presence in mature countries such as Western Europe for example. But that's a bit of the sense of the story. After all, during the inauguration of the new Manufacture, the objectives were clearly announced: we don't want to produce more, we want to produce better. No need to read in the stars to understand that the aim is that the average price of the sold watches goes up. And the collection of the SIHH 2019 is the illustration of this strategy. Let's take for example the Zeitwerk Date in white gold. This is the watch that benefits from the new caliber of this year. In fact, this Zeitwerk has many assets. I think it elegantly integrated the date display. Its shades of gray (a strong trend at Lange) are elegant, subtle. And above all, thanks to the new movement, the Zeitwerk is becoming more practical. Thanks to the pusher at 4 o'clock, the hour setting becomes more efficient and quicker. It is necessary because, due to the presence of the date display, it is necessary to think on a 24 hour base and not on 12. The setting of the date is also well designed to avoid any false manipulation. Finally, the power reserve has doubled. In short, the watch is an aesthetic and technical success. 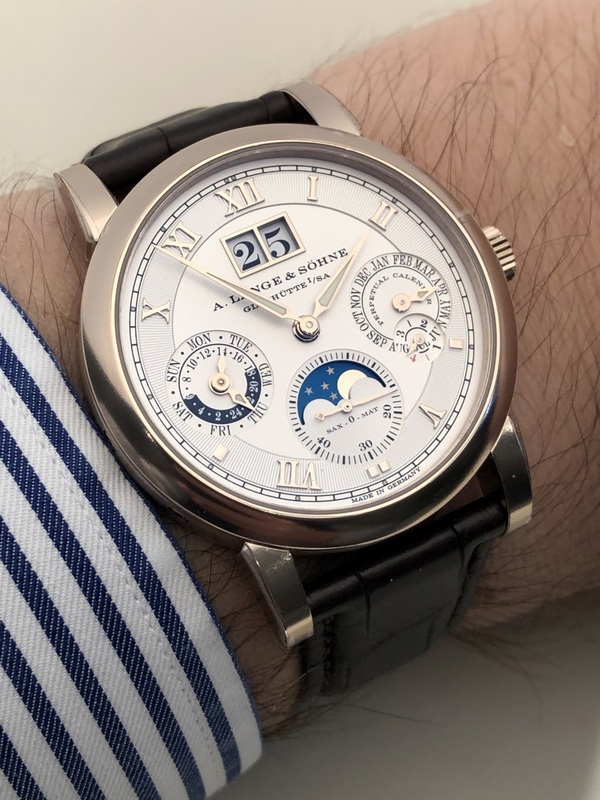 However, it suffers from two issues in my humble point of view: first its size becomes significant (44.2mm) which places it at the same diameter as the Zeitwerk Striking Time. 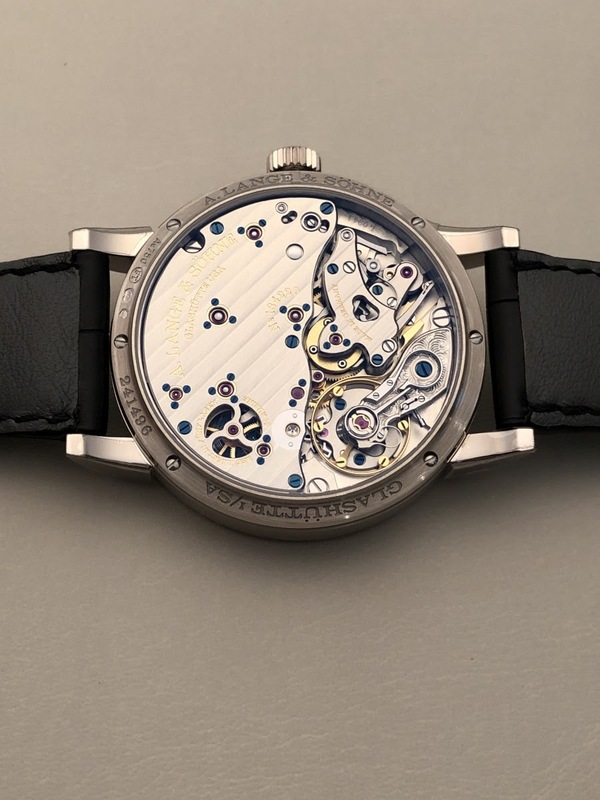 Then its price (89,000 euros) is considerably higher than the one of the "classic" Zeitwerk in white gold (71,500 euros). The Datograph Tourbillon was presented in a platinum version with a black dial in 2016. This superlative watch required the specific development of a new movement. 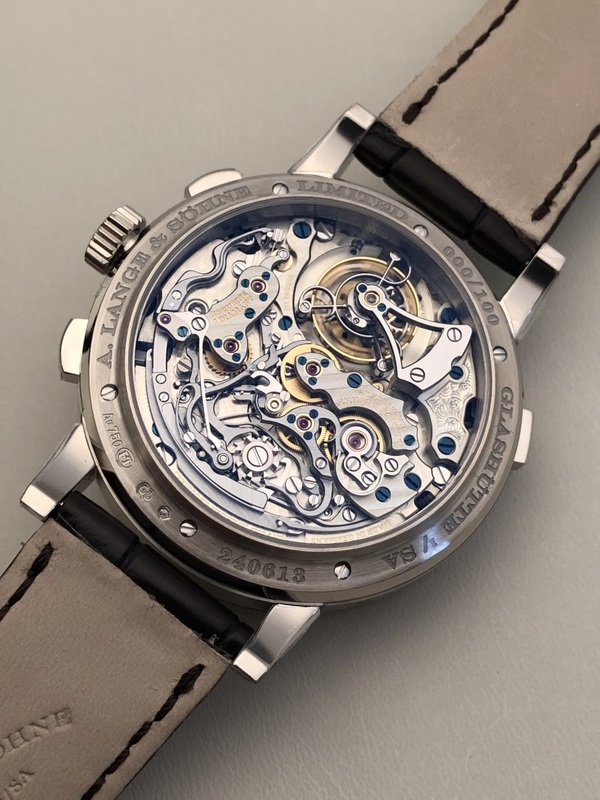 Lange & Sohne did much more than simply adding a Tourbillon to the Datograph Perpetual's movement. Everything had been redesigned in order to optimally integrate the Tourbillon, visible only on the movement side. The Datograph Tourbillon is back this year in the context of a new limited edition of 100 pieces in white gold with a beautiful pink gold dial. 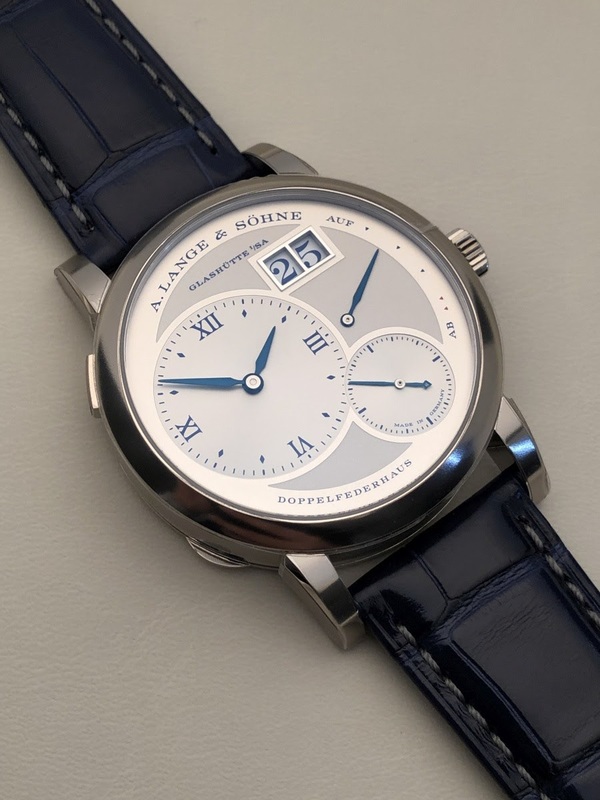 I am very happy with this choice which makes the watch bright and brings a new stylistic dimension to Lange & Söhne. I would almost believe myself back in the early days when amazing colors were available in the catalog! The price of the Datograph Tourbillon in white gold is 285,000 euros. 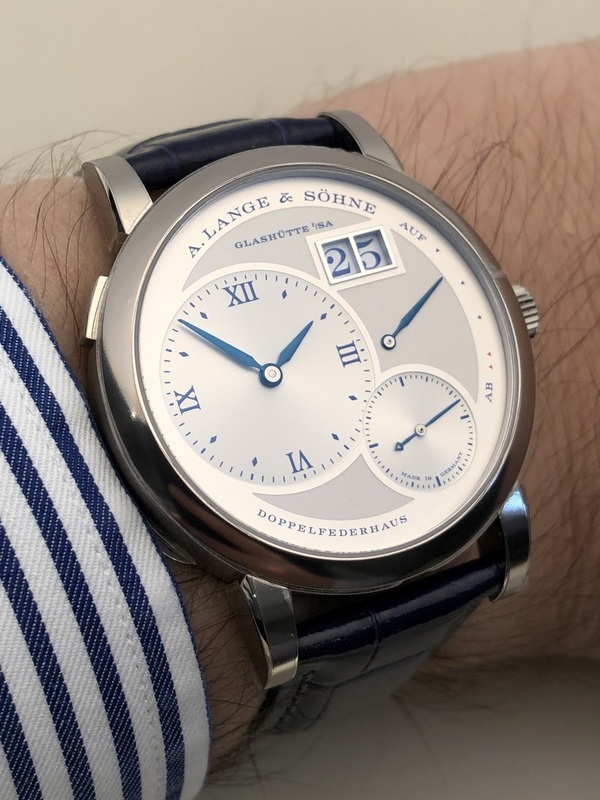 The Lange One 25th Anniversary gave me mixed feelings. This white gold watch is obviously offered as part of a limited edition of 250 pieces. 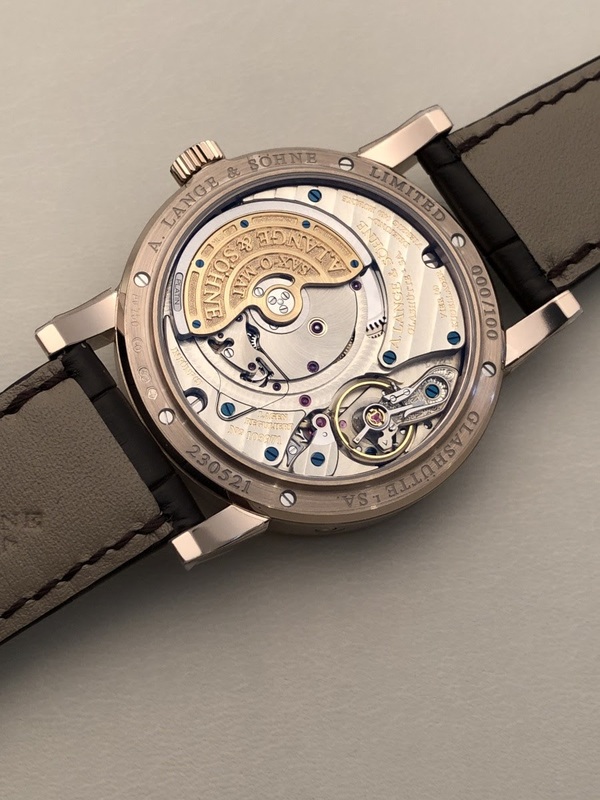 If I like certain details like the 25 on the balance wheel bridge and the subtle touches of blue on the dial side, I must admit that I am much less fan of the hunter caseback and of the engraving. I find that they age the watch and it loses its modern and contemporary side. Of course, I welcome the homage to Walter Lange and Günter Blümlein but the execution of the engraving didn't inspire me. 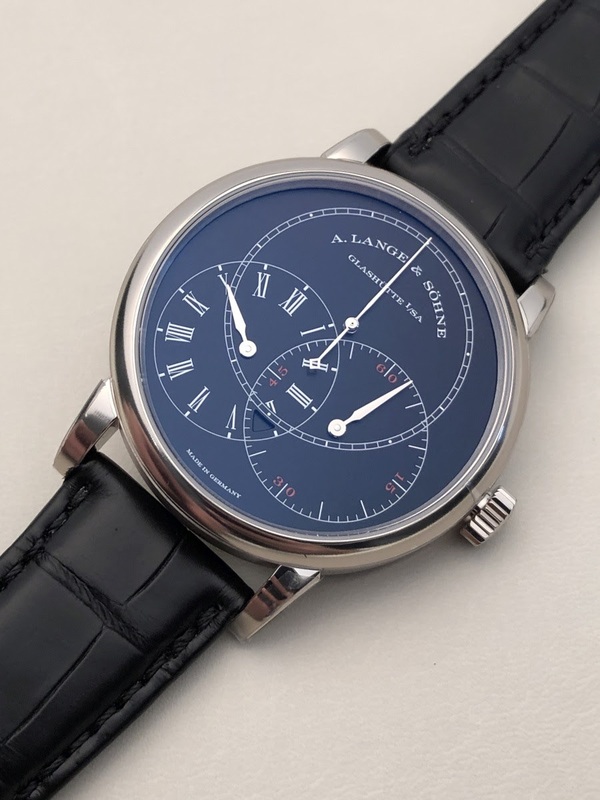 The Lange One remains a watch which remains very contemporary 25 years after its release. This is the strength of its design. So I would rather have preferred a celebration that projects it into the future than a look to the past. 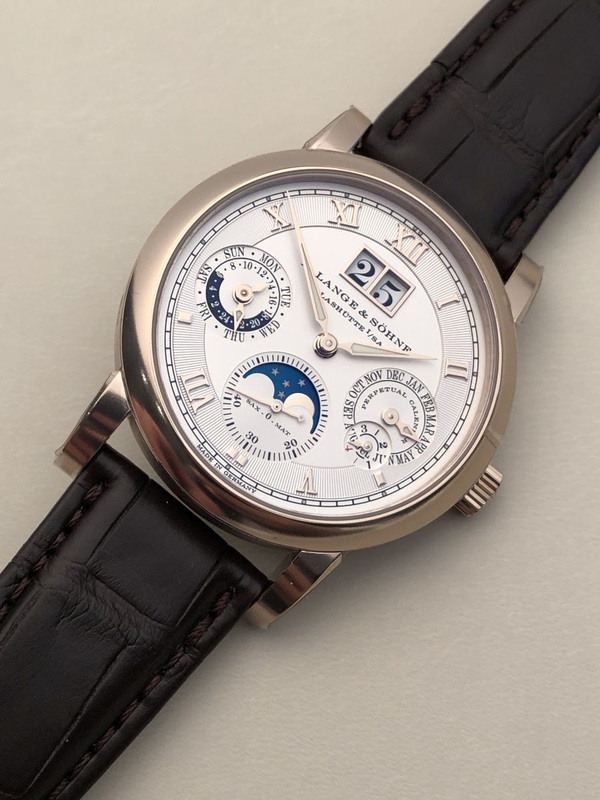 The Langematik Perpetual occupies a special place in the catalog of the brand. It is the only watch, with the Saxonia Annual Calendar to use the Sax-o-Mat caliber with 3/4 rotor. Here it is now available only in this new honey gold version. I like this refined watch that has nice details like the discreet guilloche of the peripheral ring of Roman numerals. The honey gold case works perfectly with this dial. And then, we can say that a big date display, it's still better for a calendar watch. A great success even if I must admit that I would have maintained in the catalog the white gold version with black dial to offer two very different watches. The price of this Langematik Perpetual in honey gold is 85,000 euros. Finally, the last novelty is my favorite by far. I find the Richard Lange Jumping Seconds in white gold gorgeous with a black dial. 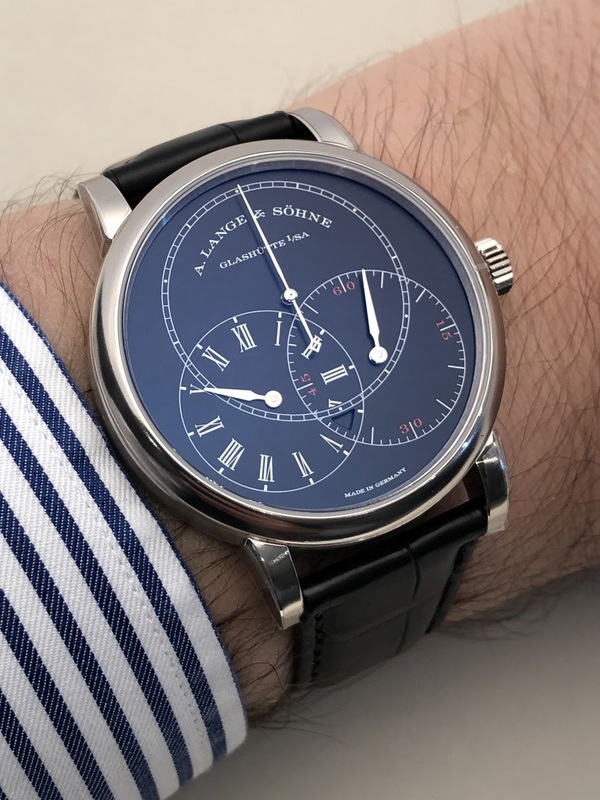 This watch was already my favorite Lange piece of recent years. I find it technically accomplished and successful from an aesthetic point of view. The black dial makes it less formal and gives it a very contemporary style that I like very much. Then we just have to appreciate the special behavior of the large second hand! Its price is 71,000 euros. In a nutshell, this collection seduced me because the changes made on existing models are relevant. The movement of the Zeitwerk offers significant technical improvements what is interesting for future models of the collection. I remain however disappointed by the Lange One 25th Anniversary. 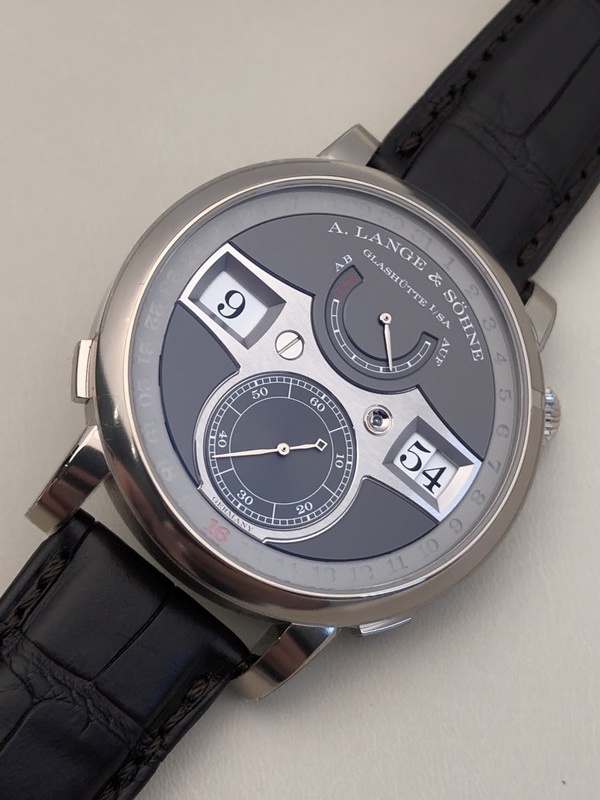 But that's not a big deal: there are enough Lange One in the catalog to find its fav model. Now, I just hope to see these new models quickly in the boutiques: the Manufacture is expected on this point and must imperatively reduce its production delays. Finally, the topic of the entry-level watch remains unresolved. 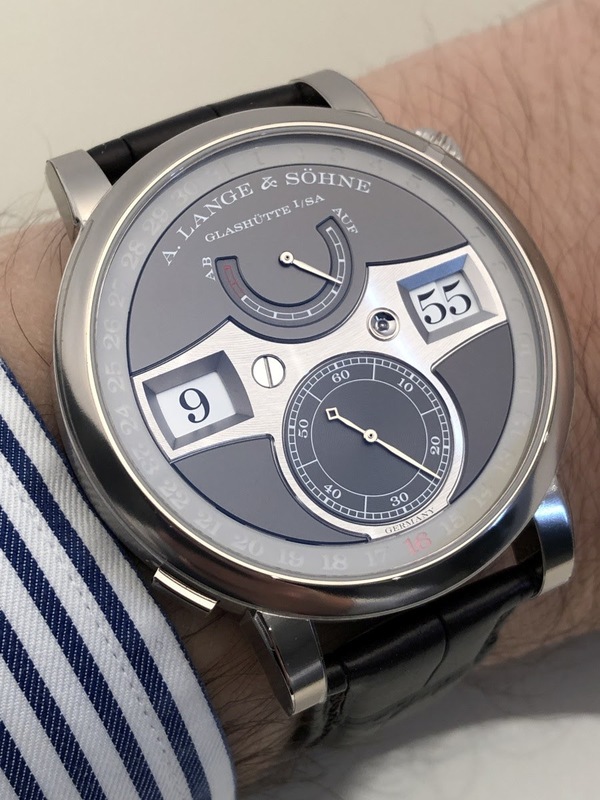 Lange & Söhne must seriously work on this subject to propose a watch that brings a new dynamic and a more audacious aesthetic than the current Saxonia or 1815. I would particularly like to thank the Lange team for the quality of their welcome during the Show. 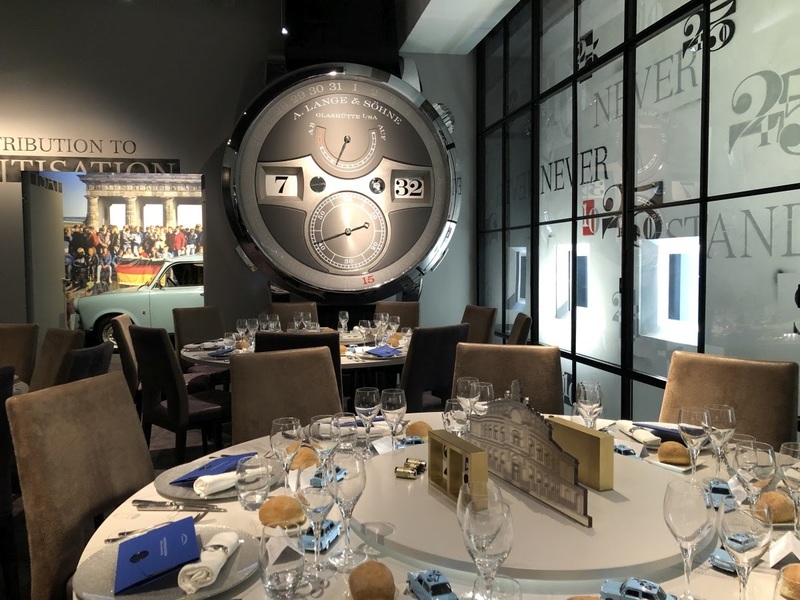 The organization of the dinner on Tuesday night inside the booth was a great idea and this event will remain for me the best moment of the SIHH. But they were 5 :-) Thanks for your words! You are right: More evolutions than revolutions. 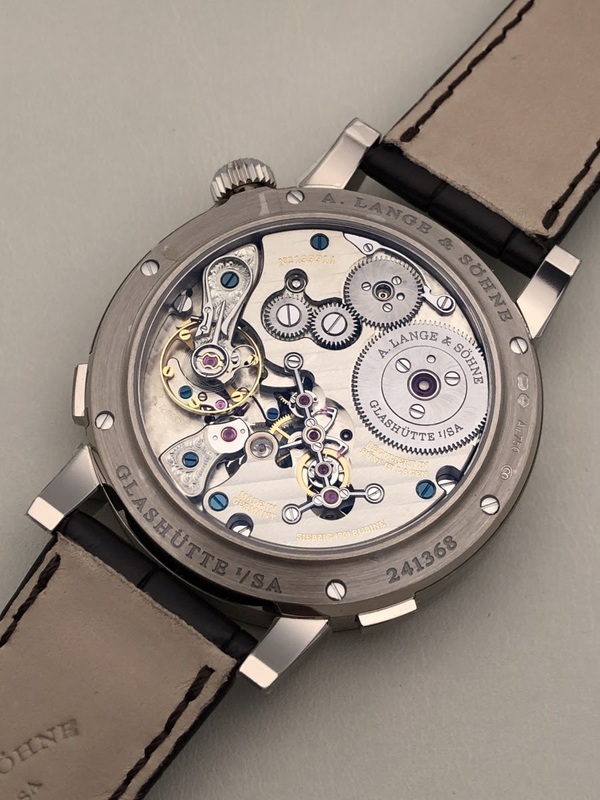 My favorite of the year, in the Lange collection: The Richard Lange Jumping Seconds WG. Really cool! Thank you Fx beautiful pictures. During SIHH they all seems amazing, somehow now I am cooling off.